We had a very busy Christmas, as usual, and our first concert was at All Saints, Oystermouth, in aid of ‘Maggies’, a cancer charity. The church was full and the choir was directed by Gareth Widlake, who is one of our baritones. Although he has only been in the choir for a year, Gareth was formerly headmaster at Bishopston Primary School and, as he says, he is used to dealing with children, and this is no different!! The choir sung brilliantly and we were also fortunate to have Steve playing his keyboard accompaniments to various items as well. The soloist was Anwen Pike. We have been informed that £2500 was raised for the charity and, again, our services were completely free. Our next concerts were the same as last year, also, with the first being at the Scout Hall, Brynmill. This is organised by our Ladies Committee and a great buffet was provided by them. 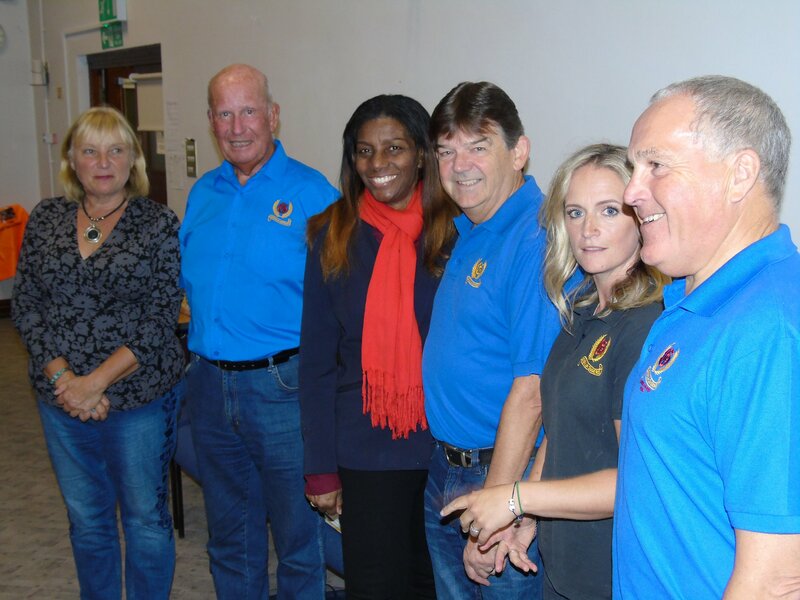 Their Chairperson, Linda, gave presentations to the musical team and also a cheque for £2000.00 for our forthcoming trip to Barbados, which was absolutely fantastic and very gratefully received. The choir is going from strength to strength; when other choirs are dwindling in numbers, and we staged our biggest ever choir with 61 singers on stage. We had 8 new members during the year and it is all to do with the work of the choristers encouraging people to join. The evening also raised over £500 for Diabetes UK, which is the charity chosen by Nick, in memory of Debbie. On Thursday 13th, we sang at the Vivian Hall, Blackpill, and again the hall was full and a great atmosphere created. However, it is getting a bit of a squeeze in the hall for the choir with our growing numbers! The highlight for the audience, as ever, was the communal singing of ‘The 12 Days of Christmas’ and we also sang ‘One More Mile To Go’, by Chris DeBurgh, again this year among our Christmas items. We sang at the Christmas Community Concert at St Thomas church on December 18th. This is definitely the highlight of our Christmas programme with the old church absolutely packed. 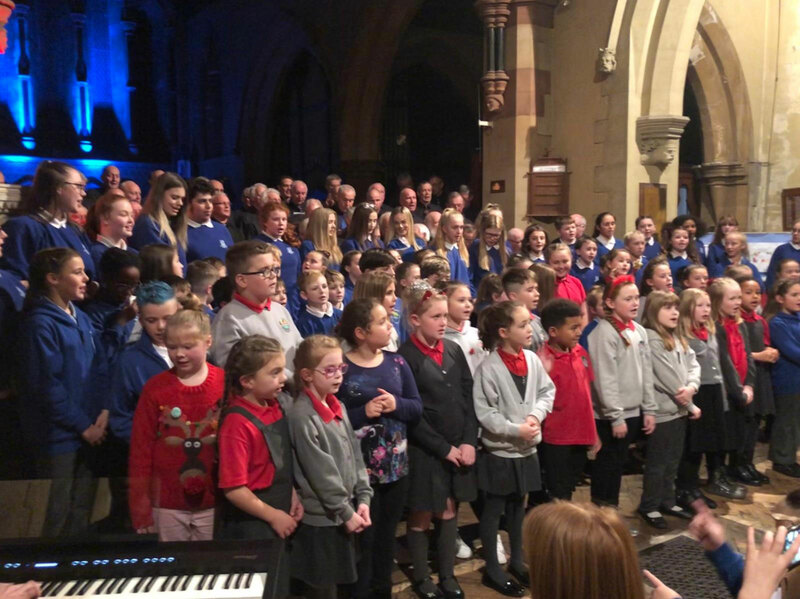 There was a tremendous atmosphere with choirs from Danygraig Primary School, St Thomas Community Primary School, and Cefn Hengoed Community School all taking part. All the choirs sang a number of Christmas items and we finished the concert with ‘Rockin’ Around The Christmas Tree’ which brought the audience to its feet. All the choirs then joined to sing ‘We Wish You a Merry Christmas’. This was the last event in the church, as it is, because work is starting on making the church into two floors with a community hall on the ground floor and a church upstairs. We wish the vicar, Steve Bunting, and everyone much success with this project. Our last concert was held at the Pier Cafe on Thursday 20th. This is the 3rd year we have sung at this event and, again, it was a great success, although ticket numbers are now being monitored carefully. However, there was still a lovely atmosphere in the Cafe and evening was introduced by Siany Martin, from ‘The Wave’ radio station. Once again we had a busy Christmas and all the effort to learn a good number of Christmas items was well worth it. We also had over 50 singers at every event, which was a terrific achievement. 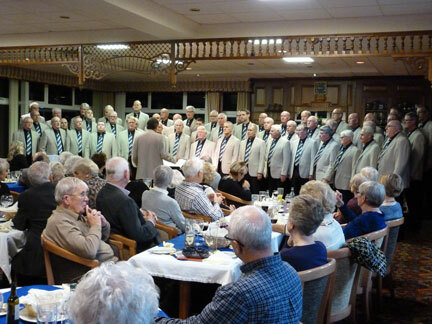 Our first concert following our tour to Kiel was held at Clyne Golf Club on November 12th. The club was packed and we had a lovely evening. The concert was in aid of ‘Save the Children’ and we raised £1100 for the charity. Of course, we gave our services free of charge so every penny went to the charity. The evening was organised by Joan Jory and her husband, Jeff, introduced the concert. Jeff was a former member of the choir and it was great to see him there. We sang at the wedding of Amy Staddon and Liam Jenkins on Saturday 17th November. It took place at St Thomas church and Amy is the daughter of our second tenor, Gareth. We were pleased to welcome 3 new members to the choir and we are really lucky because all 3 are experienced choristers. Vernon Ward has moved to the area from Cheshire and has joined the second tenors and Brian Brent and Brian Miles have joined the first tenor section. We hope they all have a long association with us. We were sad to learn of the passing of Emil Jones, a wonderful top tenor, who had been with the choir for over 20 years. He will be greatly missed by all his family and friends and we sung at his funeral at Llanelli Crematorium. We also had the dreadful news that Debbie, our MD Nick’s wife, passed away following a short illness. Debbie was a great support to Nick and knew all about his passion for the male choir institution, having known him for nearly 40 years. She was a regular on the choir tours and had a great friendship with Rhian and many of the wives and partners. She will be greatly missed and our heartfelt sympathies are with Nick. Our European tour took us to Kiel, North Germany this year and had its origins in Mannheim in 2012 when we sang with a mixed choir from Kronshagen (a suburb of Kiel). We had kept details of their MD, Imre Sallay, and asked whether they would accommodate us and they dutifully obliged. Just by sheer chance they have an annual concert on the last weekend in September! We had 42 choristers and a number of wives and partners and arrived on Thursday 27th at around 7.00pm and went straight to the ‘Alte Muhle’ (Old Mill) restaurant and had a lovely meal. On Friday we had a guided to tour around Kiel, by coach, which was very interesting. Kiel is a harbour city and is on the north east coast of Germany facing the Baltic Sea. We finished up by visiting the Laboe Ehrenmals (Naval Museum) where, in the Great Hall; we sang 3 items and laid a wreath at the memorial which has been set up for drowned and fallen sailors everywhere. This was a very emotional time with many of the choristers suffering from ‘lumps in throats’ and some were even moved to tears. Many of our ladies were also overcome by the occasion too. 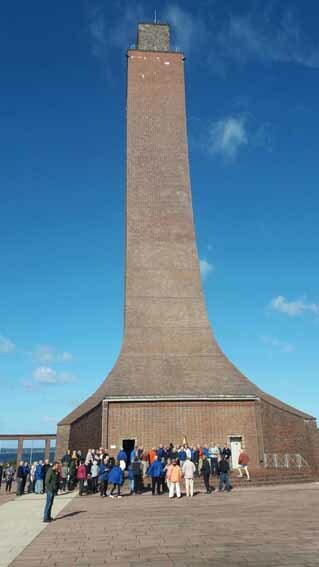 We then had a meal at the restaurant ‘Heimathafen’ (Admiral Scheer) and many took a lift to the top of the tower of the Great Hall, which gave splendid views of the Harbour and surrounding countryside. In the evening we went to Rendsburg to sing at St Mary’s church. 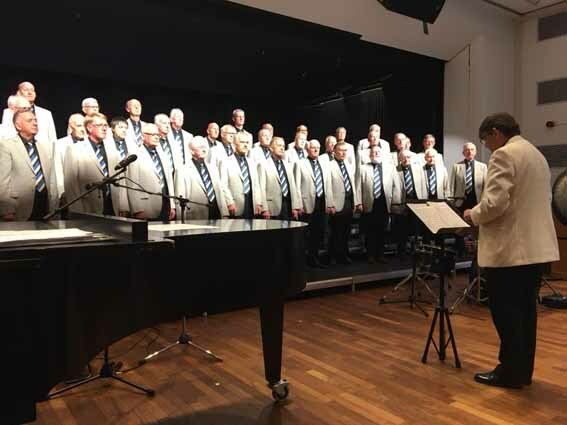 We were joined by the Rendsburg male voice choir and ‘Liedertafel’ (another local male singing group), who joined together for the very first time for the concert. The concert took a different format to what we usually do as, following 2 sets by each of the choirs we went, with the audience, to have the refreshments. After this we went back to the church to finish the concert by singing another set each! It was great to see that the audience returned too! We finished our final set with ‘An American Trilogy’ and the appreciative audience; together with the other two choirs, got to their feet to give us a terrific ovation. Indeed, the church was a lovely place to sing and we had given a splendid performance. There were some presentations made at the end of the concert and we then returned to our hotel much later than we had anticipated! The next day we were up early and travelled to the small town of Plon and went on a boat trip around Lake Ploner. This took a couple of hours and we returned to the hotel to get ready for the evening concert. This was the main event of the tour and we sang with Chor Kronshagen at the Burgerhaus, Kronshagen. It was a very large hall and there were over 400 people in the audience with many local dignitaries there also, including the Mayor. It was also 99th year of the existence of Chor Kronshagen. It really was a special event and Chor Kronshagen sang a very varied programme with music from all ages. They finished their first set with ‘Ar Hyd Y Nos’ (They have had a long association with a choir from North Wales) which they sang in Welsh! We then sang our first set, which included ‘Sanctus’, by Schubert, which we sang in German, and finished with ‘Cwm Rhondda’ which brought the 400 strong audience to its feet in appreciation. We don’t remember having a standing ovation in the middle of a performance before! Following the interval it was pleasing to hear Chor Kronshagen singing some modern songs and they included ‘Can you feel the love tonight’ and finished with Michael Jackson’s ‘Heal the World’. A lovely performance, and the 50 singers in the choir made a very beautiful sound, and were well directed by their MD, Imre Sallay. We then sang our final set and again received a standing ovation where another item was demanded. We obliged by singing ‘As Long As I have Music’, which was a fitting end to another great performance by the boys. However the concert did not finish there as both choirs joined together to sing the amazing ‘O Fortuna’ and ‘Fortune Plango Vulnera’ from ‘Carmina Burana’ by Carl Orff (Many will remember ‘O Fortuna’ as the music from the ‘Old Spice’ advert many years ago!). This was directed by Nick and accompanied by Imre, on the piano, and Stefan Bihary on percussion. The choirs made a great sound and did really well to keep everything together. Many presentations were made to conclude a wonderful evening of singing, and hopefully, we may all meet up again someday. 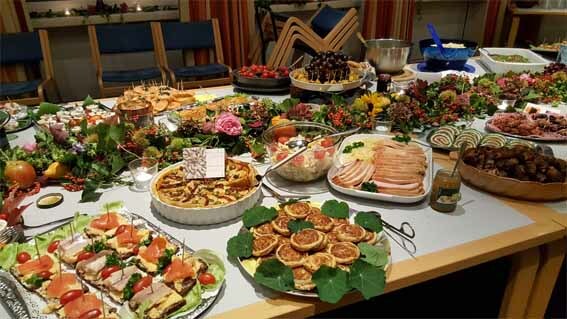 The most sumptuous buffet followed the concert and wine and beer flowed which was much appreciated by everyone and many thanks must go to Chor Kronshagen for providing this. We even managed to sing a few more items including ’Freunde Schenket Ein’ which we sang in German to our hosts. We had a leisurely start to Sunday and were even more delayed, as the bus company sent the usual two buses to pick us up, but realised that one of them was not big enough for our party! The problem was eventually solved and we made our way to the beautiful city of Lubeck. The old part was very interesting with a large cathedral and church and the architecture of the buildings was quite stunning. When we returned to Kiel, in the early evening, we all had a lovely meal together at the Kiel Brewery and enjoyed their beer, which is brewed on the premises. We then returned to the hotel and a good number of us then went back to the ‘Alte Muhle’ and had a final afterglow. We returned to Swansea on Monday and arrived at around 8.00pm. This was another wonderful tour and there are so many people to thank. The coach company was ‘Reisebyer’ and they had organised the hotel and arranged for buses to carry us around to every event. Apart from the one slight mishap, they were excellent. Our own secretary Alan Clewett, as usual, worked tirelessly before and during the tour to make it such a success. Lawrence, our treasurer, also worked so hard to collect monies during the year and during the trip with his usual efficiency. We had 2 of our ladies, Patsy Dewar and Jan Davies, to sell CD’s at the venues, and they took nearly 300 Euros over the two concerts. Adrian Crowley took charge of one of the buses and carried the CD’s around with him. Thanks to our musical team of Nick, Rhian and Steve, who never fail to bring the concerts together, and ensure a high quality of performance. Lastly, to the members of the choir, who committed themselves to the tour and sang so well. Back to the grind now and rehearsals start for our busy Christmas period! On Thursday September 13th we sang at All Saints Oystermouth for the Mumble Festival of Music. This is a series of concerts is held annually, in September, at the church and we were delighted to take part this year. We were fortunate to be joined by Ros Evans, who is always very entertaining, We were able to sing a number of the new items that we have learnt for Germany including Wagner’s ‘Prayer from Lohengrin’ and ‘Freunde Schenket Ein’ which went down very well. We also sung Schubert’s ‘Sanctus’ from his ‘Duetsche Mass’. Another highlight of the concert was joining with Ros Evans to sing our arrangement of ‘The Holy City’. On Tuesday 18th we had some special visitors to our rehearsal. We are in the early stages of arranging a tour to Barbados next year to sing at their Celtic Music Festival, which is held annually. The Director of the Festival, Carol Anderson and the Acting High Commissioner for Barbados and the Eastern Caribbean, Alphea Wiggins came to give us more details about the festival. This is a really exciting time for the choir and we are hoping that we will be able to sing at the festival. 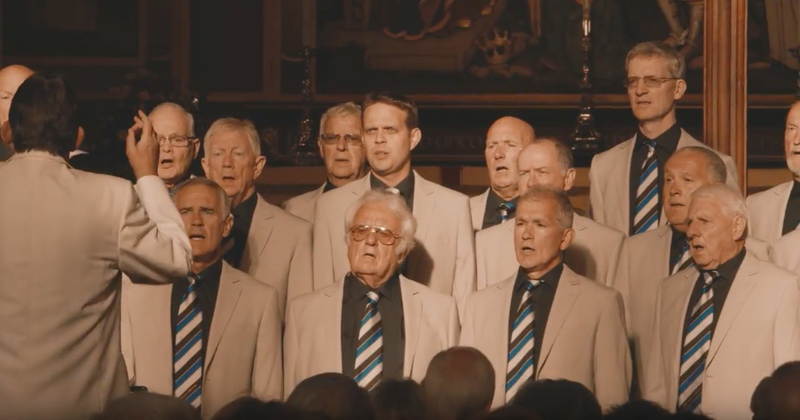 They have not had a Welsh male voice choir there since the first festival 19 years ago! Watch this space for further updates. Again, another quiet month but we continued to rehearse and have welcomed 2 new members to the choir. John Barnett has joined the 2nd bass and Rogers Gadd, the baritone section. We were also able to work hard on the items that we will be singing in Kiel, Germany, on our annual tour. We are learning a new item to the choir ‘Freunde Schenket Ein’, a drinking song, which will feature a debut soloist in the choir, Clive Dowell. We’ve had a quiet summer but on Sunday 29th we were asked to sing at Stouthall (Carreg Adventure) for a group of students, who were visiting Wales, from Kuwait. Having previously entertained foreign students at Stouthall, we were looking forward to singing to them and, once again, they were a very appreciative audience. They enjoyed our performance and. as a special request from one of the students, we were asked to sing ‘Can’t Help Falling in Love’. Although not in our repertoire, it is one we sing at our ‘afterglows’, so we did our best to sing it and we were also joined by a number of the students! Following the concert we stopped off at the King Arthur, Reynoldston and ended up having a short ‘afterglow’. A few days later we appeared in the ‘Wales On-line’ website, as, unknown to us, one of the staff had recorded our singing and sent it to them. There was a small feature about the choir and the video was included as well. This was a wonderful evening – probably the best yet! 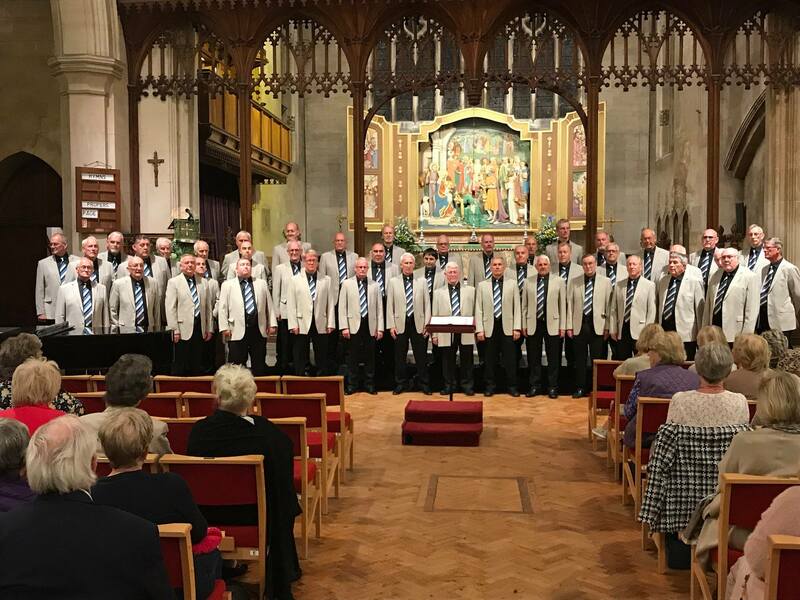 We were fortunate to have the fantastic ‘Bella Voce’ with us, who had only 5 weeks earlier performed at the Royal Albert Hall, London, with the massed male choirs. They are a ladies group of 16 members, formed in 2013 by their musical director Sarah Benbow-Thomas and Lisa Shelmerdine Richards and come from South Pembrokeshire. They boast around a dozen music degrees and have over 30 instrumental and vocal Grade 8’s between them and, together with their accompanist Seimon Morris, make a brilliant sound. The concert was held at All Saints, Oystermouth and we opened the evening with ‘Morte Criste’ to a tremendous ovation from the packed church. This set the scene for the rest of the concert. We followed this with our 2 Italian items, ‘Ave Maria’ and ‘Nella Fantasia’ and finished the first section with ‘How Great Thou Art’. This is becoming a very popular item and, considering all the key changes and the fact that it’s unaccompanied, we performed it really well. Bella Voce then started their first set with ‘It Don’t Mean a Thing, If It Ain’t Got That Swing’ and followed this with ‘Cwlwm Cariad’ by local composer Alan Llewelyn Thomas. Other items in this section included an arrangement of a song made famous by the Flying Pickets, ‘Only You’ and their last item was ‘Who Will Buy’ from ‘Oliver’. We then sang 3 Welsh items, ‘O Gymru’, ‘Ar Hyd Y Nos’ and our rousing setting of ‘Cwm Rhondda’ to end a fantastic first half. Both ‘Morte Criste’ and ‘Cwm Rhondda’ featured Steve on the organ, together with our accompanist Rhian. Following the interval we sang the lively ‘Hey Look Me Over’ and then we sang some more modern popular sings. First was a new item to our repertoire ‘Hard To Say I’m Sorry’ which is the lovely song written and performed by ‘Chicago’ in the early 1980’s. We followed this with ‘God Only Knows’ and finished this section with the Elvis Presley number ‘If I Can Dream’. Bella Voce returned and delighted the audience, once again, with their items. They started with a delightful arrangement of ‘Three Little Maids’ and followed this with ‘Pure Imagination’. They finished this set with an arrangement of the lovely song by Snow Patrol ‘Run’ and their final item was a new upbeat arrangement of ‘Calon Lan’, with a terrific accompaniment, brilliantly played by Seimon. This was truly a memorable performance by the ladies, full of beautiful phrasing and musicality and deserving of their huge ovation. Our final section started with ‘He Ain’t Heavy He’s My Brother’ and one of our favourites, Robbie Williams’ ‘Angels’. Our last piece of the evening was Alwyn Humphreys’ arrangement of ‘An American Trilogy’, again with Steve on the organ, which brought the very appreciative audience to its feet. We then introduced Bella Voce back to the stage and the concert closed with everyone singing our National Anthem. A number of presentations were made by our President, Geoff Wheel including one to our Ladies Committee Chairwoman, Linda Lewis, who works tirelessly throughout the year, with her fellow members, to raise funds for the choir and steward the ‘annual’. This was, surely, our best ever ‘Annual’ and thanks must go to our MD Nick, brilliant accompanist, Rhian and organist Steve, who also played harmonica for ‘He Aint’ Heavy’! The wonderful All Saint’s Church proved a great venue again and there were many others who contributed to the success of the evening. We were sponsored by the Swansea Building Society and thanks must go to Alun Williams and his team for their financial support. Adrian Crowley arranged the writing and printing of the programme and arranged for the concert to be recorded by Ken Geen, from Cardiff, and also a video has been made, by Tom and Jenna of Cardboard Donkey, of some of the items and, hopefully, both of these will be released soon. Ticket sales were again looked after very efficiently by Walter Jones. June is always a busy month with our Annual Concert coming closer. 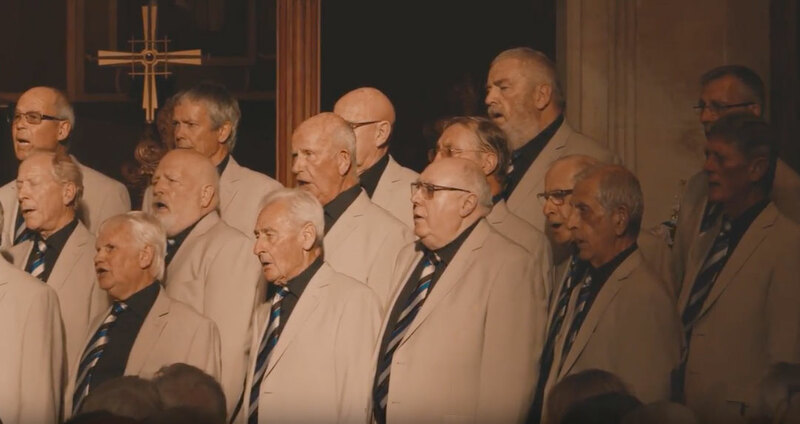 However, this year our minds were taken off the concert for a while, as we were asked to sing at a 90th birthday party on Wednesday 20th June, at Dewshall Court in deepest Herefordshire. The venue was a bit difficult to find, as we had to negotiate some rather narrow lanes which were not always recognised by the ‘Sat Nav’. However, eventually, we found the hall, via the old fashioned way of a sign in the hedge! Although we were small in number we gave a rousing performance which was enjoyed by all the family members and friends. We sang a varied programme to suit all the ages present and had to sing an ‘encore’ after receiving a standing ovation following our last item. We were treated to sandwiches and a ‘pint’ at Dewshall Hall and then went to the Clytha Arms near Raglan on the way home for further chips and beer. 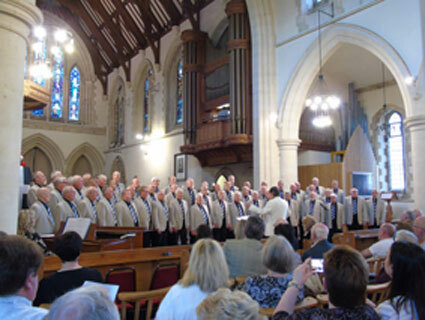 On Friday 11th May we sang at St Peter’s Church, Newton, for the Rotary Club of Mumbles. The church was full and we started with ‘Cwm Rhondda’. In the first half we included ‘Nella fantasia’ and ‘How Great Thou Art’ and finished with ‘Morte Criste’. The second half was a bit more modern, singing classics such as ‘Angels’, ‘God Only Knows’ and ‘Delilah’. We finished with ‘An American Trilogy’ with Steve joining us on the organ. The evening was interspersed with solos from Alexander Iles and Ewan Forrest, who are both members of the Ariosa Singers. They both sang well known items with Alexander singing ‘If I were a Rich Man’ from ‘Fiddler on the Roof’ and Ewan ‘My Name is John Wellington Wells’ from ‘The Sorcerer’ by Gilbert and Sullivan. During the second half they sang the duet ‘Ave Verum’ by Karl Jenkins. Their accompanist on each occasion was Lisa Mears. 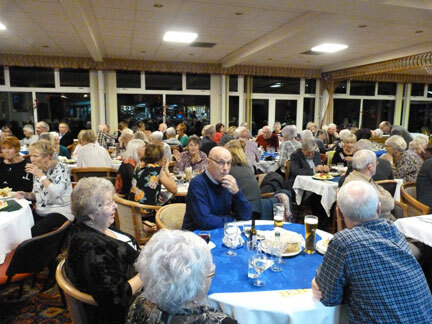 This was a great night organised by Doug Camp and Phillip Rogers, from the Rotary Club, and all money raised went to ‘Ty Olwen’ and ‘Rotary’s Polio Eradication Campaign’. We, of course, gave our services free of charge. On Friday 20th April we sang at the wedding of Shaun Sturgess and Aimee Jones at St Hilary’s, Killay. It was a beautiful day and we sang the happy couple out with ‘All You Need is Love’. 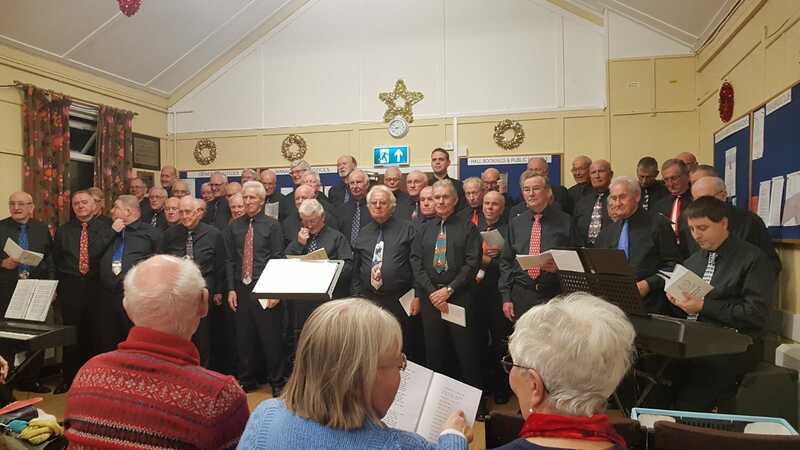 The following night we had a joint concert with Newquay Male Choir, from Cornwall. 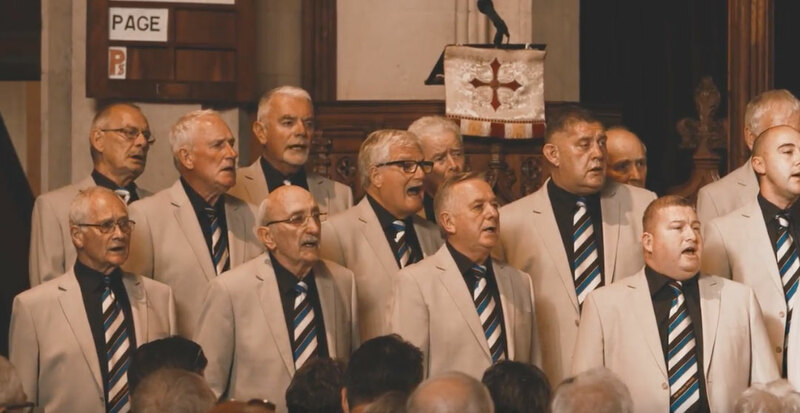 They were on a short tour to Wales and had sung with Tonna Male Voice Choir, in Neath, the night before. The concert was held at St Mary’s Church, in the centre of Swansea, and this proved to be a great venue. There was a large audience and they were well entertained by our visitors who started with ‘When the saints go marching in’. Although they were a small choir they made a great sound and were very disciplined. During the evening they sang a number of well known pieces and a few Cornish songs. We also sang items from our normal repertoire but a highlight was the singing of ‘How Great Thou Art’, which we have been learning over the last few months. This is a new setting and the wonderful acoustic in St Mary’s helped to make this item, with its terrific climax, a huge success. The concert was very kindly sponsored by Tomos Watkin Brewery and Liberty Homes and we thank them for their tremendous support. We finished with ‘American Trilogy’ and then the two choirs joined to sing ‘Morte Criste’, which was a fitting end to a lovely concert. We all then adjourned to the ‘Cross Keys’ where a buffet had been prepared for us. 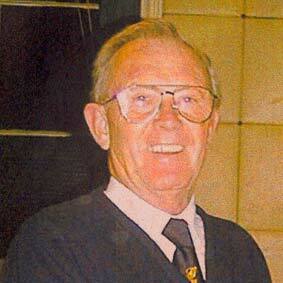 On a sad note we learned of the passing of one of our stalwarts, Vernon Simons, following a long illness. 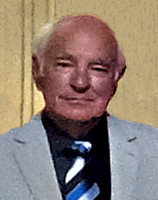 Vernon would have completed 50 years service this year, and had previously taken a very active part in the choir where he had sung many solo items, with his beautiful tenor voice. He was also Chairman some years ago. He also served on the committee and his wife, Althea, had given so many years commitment to the Ladies committee. We were very happy to be asked to sing at his funeral at Bethlehem Chapel and at Llanelli Crematorium, where we sang Robat Arwyn’s ‘Benedictus’. He will be sadly missed. 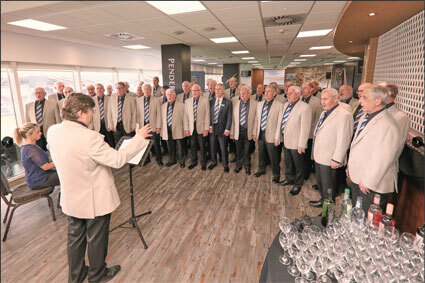 On Thursday 26th April we sang at the Liberty Stadium for the AGM of the Swansea Building Society. The Building Society has been very kind to us by sponsoring our annual concert this year and we are very grateful for their support. This will, hopefully, lead to a long term relationship. We held our AGM on Tuesday 6th and it was well attended. Our president, Geoff Wheel, opened the meeting and our chairman, Clive, thanked all the officers for their hard work and also the musical team for their energy and commitment. Our MD, Nick, then pointed out that 2017 was a record breaking year. We had our biggest ever choir at our annual concert (56), our biggest ever attendance at a rehearsal (56 on 2 occasions. However, this has already been broken this year with 57 attending a rehearsal in February!) and also the largest number of choristers on our European tour (43). )This is a magnificent achievement by everyone, especially at a time when male choirs’ numbers are considered to be in decline. On Saturday 24th March we sang at Langland Bay Golf Club for the charity ‘Forget Me Not’. This charity runs Dementia Day Clubs, which aims to help people with all types of dementia. Club captain, and former International Gymnast, Lee Jones, introduced us and we gave a lovely concert which was well appreciated by the small audience. This was followed by cheese and wine. Once again, following on from our busy Christmas we had a quiet start to the year. We also found that our new rehearsal room was not what we wanted and, thanks to Walter Jones, we moved to Holy Cross Church, West Cross, for a few weeks. On occasions, when we learn new items, we like to split the choir into tenors and basses and use different rooms for rehearsing. Unfortunately, this could not be done at Holy Cross and we have now moved to the Linden Christian Centre, which is just down the road. This appears to be a great facility for us, and will hopefully become our base. 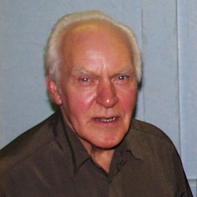 It is with great sadness that we report the death of Mal Herbert who sang with the choir for over 30 years. He had been Part Steward for the bass section and he taught new bass members a tremendous amount. He was a committee member from the very early days and became Secretary of the choir, a position that he held for many years. He will be greatly missed. His wife Pat worked hard for the ladies committee, and and we send her our deepest sympathy. We welcome Billy McCarley to our 2nd tenors. He had his voice test and did very well, and we hope he will have a long stay with us. We have also had a few other probationers with us and, hopefully, we will be adding to our numbers in the next few months. Our quiet spell has given us the opportunity to learn some new items. We have been working hard on a wonderful arrangement of ‘How Great Thou Art’ which has put us slightly out of our ‘comfort zone’. It has been arranged by Jim Clancy, from the American chorus, Vocal Majority, and is completely unaccompanied and has an amazing climax. To read more of our news from the last 48 years please click here.